This is the cover of my newest release from The Wild Rose Press. I love the blue and the water. Wild Rose Press artists alway make beautiful covers that are so appropriate to the book's text. It's like they have ESP or something. 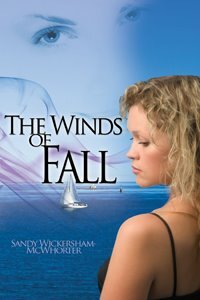 The Winds of Fall came out in print on December 19, 2008. This is the book of my heart; the first book I completed. Sci-fi is my first love in the fiction realm. I lived and breathed sci-fi as a kid of the 50s and 60s. That said, I have a question--what is your favorite 1950s, scared-of-the-atomic-bomb, B-movie, sci-fi film? I have two co-favorites because I can't choose just one; they are The Day The Earth Stood Still and Forbidden Planet. The deep, philosophical meanings of these two movies make them eternal classics in my mind. My other question for you is more modern. I became a vegetarian in June last year due to escalating health problems--ankles the size of a watermelon and rising blood pressure--and have been learning how to eat better. BUT, the problem I've faced is family resistance. My youngest makes fun of me all the time, with snide remarks, jeers, and laughs. I'm not a vegan, who he and my other son thinks are kind of weird; I eat eggs, milk, and cheese to keep my protein levels up as I learn the vegetarian lifestyle, nor am I a crusader trying to change them! SO, why am I facing such criticism? Are any of you vegetarians, and did you face any ridicule from friends or family? While you think of answers to my questions, read an excerpt from The Winds of Fall (below) and let me know what you think of it! Powerless to resist, Skye Worthington watched her hand rise to the huge artwork in front of her. Her fingers played in the blades of blue plastic grass swaying in a soft breeze from tiny fans in the artwork. Though she didn’t want them to, her fingers caressed the little wooden people’s silken clothes. Green ceramic hills next drew her hand to them to enjoy their enameled smoothness. From somewhere in her mind, she knew these small hills represented real hills she’d seen some time before. She heard the people of the real hills pleading to her mind, Return home to fly with us on your green hills. Skye hated the feeling of aloneness flooding her mind because she couldn’t fly over these familiar slopes, as she’d done many times before. To be free you must join the people in the artwork. Her inner artist thought. No, that’s not a true statement. Her inner scientist thought back. hair around as she got closer. Tears flowed down her cheeks as a nauseating homesickness overwhelmed her. The inner-scientist panicked, silently screaming, This isn’t logical! Artworks can’t talk. Fight! She willed her gaze to move from the canvas. It didn’t. She tried to scream. She couldn’t. She tried to back up. Her foot hit the wall in front of her instead. She wanted her fingers to leave the artwork. The painting’s people shouted to her mind, Return home, or you will die! Nothing could break the magnetic bond between her hand and the white-capped acrylic ocean. Joseph Allen liked the St. Louis’s gallery’s open arrangement. The main room’s partitions only went up eight feet of its fifteen-foot height. Three or four artworks hung on each partition’s sides, giving private settings to ponder the art; the part he liked best. Skylights, and the room’s shape, reminded him of a room he didn’t see much since he became vice-president of his family’s company. He’d decided to check his contest entry before going to his hotel for the night, and he’d waited until the gallery was almost empty. The gallery’s owner had hung his entry in the best place, the back. Joe could let his guard down there. He strolled around the partitions, looking at the other contest entries. “Leave me alone. I want to go home. I must go home.” She said in a monotone voice. He could hardly breathe as he prayed no one would see them. The consequences would be unimaginable. The woman slowly turned her head toward him. Like in some nightmarish horror movie, she looked at him with vertical cat’s-eye pupils instead of human pupils. A gasp escaped his lips. He wanted to run, to hide from what he knew the future would now bring, but horrified fascination glued his feet to the floor. “Leave me alone. I want to go home. I must go home.” She replied in the same monotone. Her elbow slid into his entry as she spoke. As her face turned back to his artwork, a knife of horrendous loneliness sliced through Joe’s mind. He had to find out what made her feel that empty and alone. People can’t survive such loneliness.